Vernon Davis accounted for 61 of his team's 124 passing yards. There were few, if any, bright spots for the San Francisco 49ers in Thursday night's 20-3 drubbing at the hands of the Seattle Seahawks. Perhaps the only positive was the play of tight end Vernon Davis, who accounted for nearly half of San Francisco's passing total with four receptions for 61 yards. Although it was a much-needed bounce-back game for Davis, who had been held without a catch in his previous two games, he admitted he didn't take much solace out of the performance given the result of the game. Davis, who has been the subject of trade rumors with the Nov. 3 deadline looming, has seen his season take a downward turn following a five-catch, 62-yard performance in a Week 2 loss at Pittsburgh. He did not have a reception in Week 3 and also hurt his knee, an injury that forced him to miss the next two games. Davis returned to the lineup for Sunday's game versus Baltimore and again was held without a catch despite a season-high 340-yard game by quarterback Colin Kaepernick. So any good vibes Thursday were dimmed even more simply because of the bitter rivalry against the Seahawks, who have bottled him up in the past. 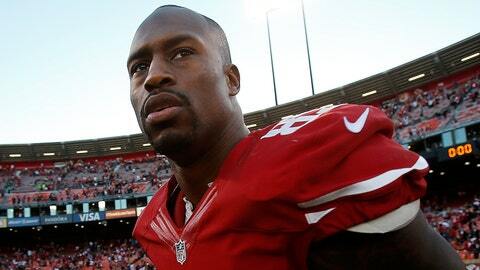 #49ers Vernon Davis receiving yards in last 7 games vs. #Seahawks: 0, 13, 16, 21, 20, 27, 0.